Modern Duroc pigs are the end result of more than 150 years of careful breeding and crossbreeding between various types of swine. According to the National Swine Registry, modern Durocs were first bred in 1812 when farmers started breeding red Duroc pigs with Jersey red pigs. Since 1860, Durocs have been bred and cultivated for their red coloring, size and meat quality -- characteristics with a lot of appeal to breeders and hog farmers. The meat from Duroc pigs is typically dark red in color, maintains moisture well and has good fat marbling throughout -- all highly desirable qualities in cuts of pork. Duroc pigs also possess a significant amount of lean muscle and when they are slaughtered the carcasses yield a high amount of usable flesh. Hog farmers favor Duroc pigs because the breed consistently yields plenty of high quality meat. Duroc pigs are one of the fastest growing breeds of pig when they're kept on a consistent and nutritious diet. They're also very hardy. Duroc pigs are favored by hog farmers who want to keep their pigs outdoors because Durocs tend to stay healthy and happy in both cold and warm climates. Durocs are known for producing large litters, especially when Duroc boars are crossed with sows of other breeds. 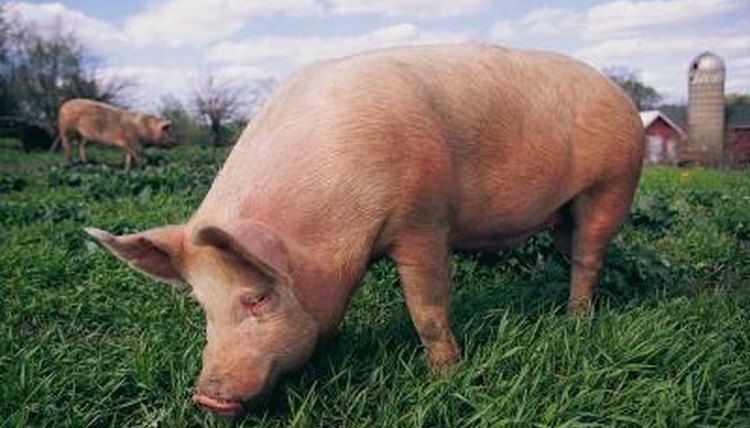 Durocs are very popular for crossbreeding and improving other breeds of swine. Duroc sows are also known for taking very good care of their young. Duroc hogs are sometimes known to be aggressive. Aggressiveness can be minimized if you pay attention to the temperaments of the animals you are breeding and make sure to properly socialize your hogs. Aggressive boars can be dangerous if not handled very carefully and must be contained properly at all times.